PNP chief, Director General Alan LM Purisima, encouraged the citizenry to thoroughly consider the following safety tips that could save precious lives and properties. 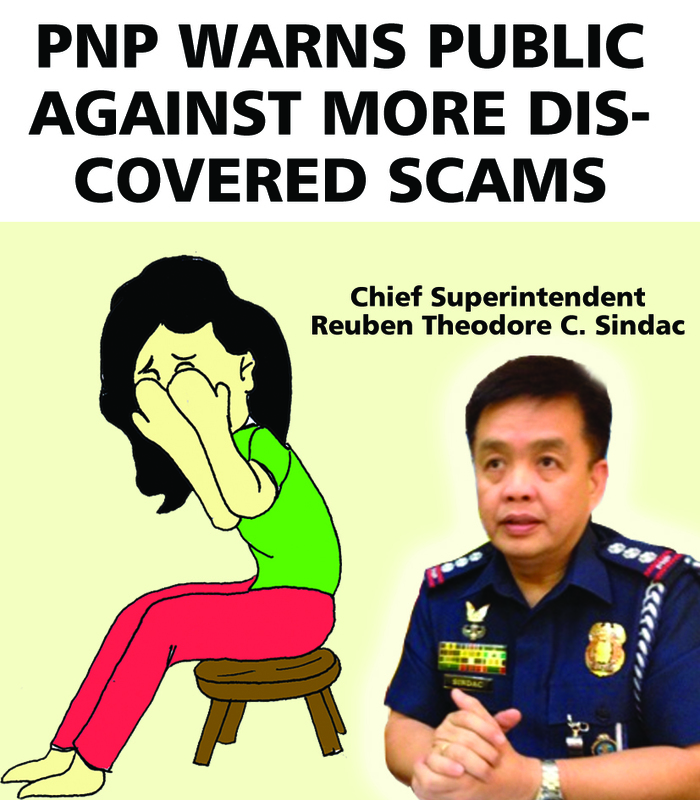 According to the PNP chief, “scammers often seek soft targets so they move on if you do not respond.” “Just block their e-mails and their accounts and cease all contacts with the scammer. If ever you encounter this kind of scam, save the scammer’s details, e-mails, comment threads, or any other evidence you have of them and the extortion attempt,” he added. TEXT SCAM is a modus operandi by unscrupulous individuals to dupe and defraud subscribers. They send unsolicited messages to entice other people into giving them money, load or personal information for their gain. Fraudsters use mobile phones to target more unsuspecting victims in the country. Text scam uses a ‘normal’ 11-digit number. Legitimate SMS promos will always be coursed thru telecommunication companies’ short codes, 3 or 4-digit numbers provided by the carrier, not the usual 11-digit mobile number format (example 0918-123-4567). The LOTTERY/PRIZE SCAM — Consumer will be contacted by SMS or e-mail with news that he/she has won a large sum of money but in order to receive the winnings, he/she must first pay the taxes by depositing into a stranger’s account. The consumer sends the funds but the winnings are never received. SCAM IN MALLS — Beware of corporate-looking people who ask you in malls if you have credit cards. Your initial reaction would be ‘yes’ as you want to get rid of them thinking that they will offer you some credit cards but think again before you try to brush them off because they will actually bug you more once you say yes. Once they know that you have a credit card, ATM card, check book or any proof that you have money that could be taken away from you, they will be persistent in inviting you over their office by enticing you with their freebies. First, ignore this kind of people. Second, if they become so annoying, report them to the mall administrator. Third, stay away from these people. THE CHARITY DONATION SCAM — The victim will be told that the culprit is a representative of either a charity organization or a recognized government foundation tasked to secure donations for a worthy cause. The victim will be given contact details and information on how he/she can donate to the fraudster via the charitable organization. THE ONLINE AUCTION PURCHASE SCAM — The consumer with the winning bid in an online auction is instructed that the seller will only accept money transfer as a form of payment. The seller may also instruct the consumer to use a fictitious name for the transfer, to ‘protect themselves’ until the goods are received — but they never arrive really. 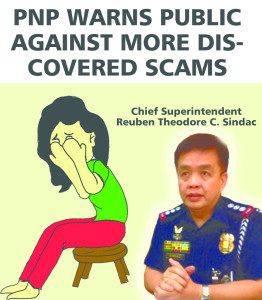 THE DUGU-DUGO OR BUDUL-BUDOL SCAM — The victim, mostly an elderly or a housemaid will receive a call from someone who claims to be a family member stating that a loved one has been kidnapped or hurt. The caller will then instruct the unsuspecting victim to make a transfer of money to a stranger to avoid the kidnapped relative from being harmed or to pay for medical expenses. In most cases, the caller asks their prey to forcibly open the room of their employers and instruct them to get cash and valuables she can find inside drawers. THE RECRUITMENT SCAM — The victim will receive an offer to a job overseas from an individual who claims to represent an agency or the employer and requests for a placement fee to be transferred to his/her account to facilitate processing of the travel documents. THE BUSINESS INVESTMENT SCAM — A business may receive a request from a stranger posing as a representative of a major corporation offering the opportunity to become involved in a large commercial operation. The offer will involve very large financial returns and will require the victim to finance portions of the business venture. All payments will be required to be forwarded in amounts between P10,000 and P50,000. Examples of the requests for money include: payment of legal fees, payment for the suppliers or sub-contractors, payment for the registration costs and payment of business taxes. This entry was posted in Advocacy, government and tagged fraudulent activities, illegal activities, scammers, tips on how to detect and avoid scams on May 16, 2014 by Yami.